In our previous three posts, we saw beautiful examples of damascus barrels and studied the method of manufacture of these barrels. Due to the labor intensive nature of manufacture of these barrels, these were reserved for use with fine shotguns and revolvers. 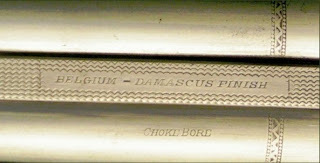 Thus, the presence of a damascus barrel on a gun was the sign of a high-quality and expensive product. However, some unscrupulous manufacturers soon found some ways to make inferior copies of these products, which they could then sell at a higher price as quality weapons. In the above, an inner tube is made of cheap iron. You can see the fibers of this cheaper iron tube, which run horizontally along the tube. Around this is wound a thin strip of damascus steel. You can see how the fibers of the damascus steel run along the length of the spiral. When the two are welded together, this has the appearance of a genuine damascus barrel and can only be told apart when pickling in acid, as the cheaper iron on the inside gets eaten away much faster than the surface layer. This practise was heavily used by some counterfeit manufacturers in Liege, Belgium. Another way to imitate stub damascus is to use a cheaper iron. Real stub damascus steel is made using iron from old horse-shoe nails, which are melted along with steel from broken files and coach springs in a puddling furnace, which makes the blooms used to make the rods used for damascus steel. The cheaper technique was to use scrap cuttings of iron and put them in a charcoal furnace (instead of a puddling furnace) and then stain them in a particular way to resemble the watering pattern of damascus steel. The counterfeiters would stain the barrels very dark and then, a weak solution of muriatic acid would be applied with a sponge to those areas where the staining was darker, to make it more even. Then they would scald the barrel in hot water to stop the staining process. The result was very hard to tell apart from the real thing, except by subjecting the barrel to stress testing. This technique was common in England, as well as parts of Europe. Similarly, barrels made of "threepenny skelp", "twopenny skelp" or "sham damn skelp" were made of very inferior materials and sold as damascus steel barrels. In most skelp barrels, the rods were not twisted together before manufacturing and hence the grain of the iron would be different from that of a damascus barrel. The solution to this was to paint on a cheap stain that resembled a fine English twist barrel, or put cheap engraving on the outside to resemble a damascus twist. 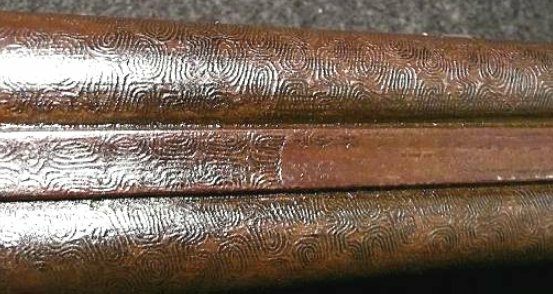 One way to find out fakes was to remove the barrel from its wooden stock, because the forgers usually didn't bother to touch those parts which are hidden by the wood. As you can see in the above, this fake damascus barrel gun hasn't aged very well due to its inferior materials. It is made of cheap iron and has an engraved twisted pattern on it to try and imitate the patterns of a low-end or single twist damascus barrel. 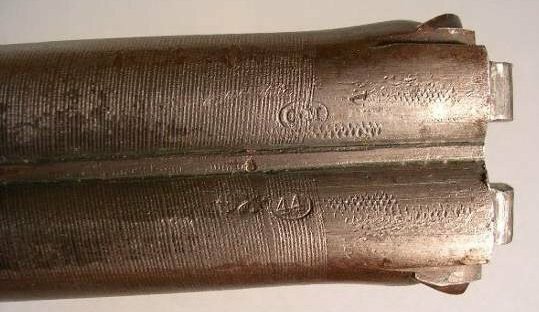 In our next example above, the barrels are also made of cheap iron, but the attempt is to fake the patterns of a three-stripe damascus or fine English damascus steel barrel. 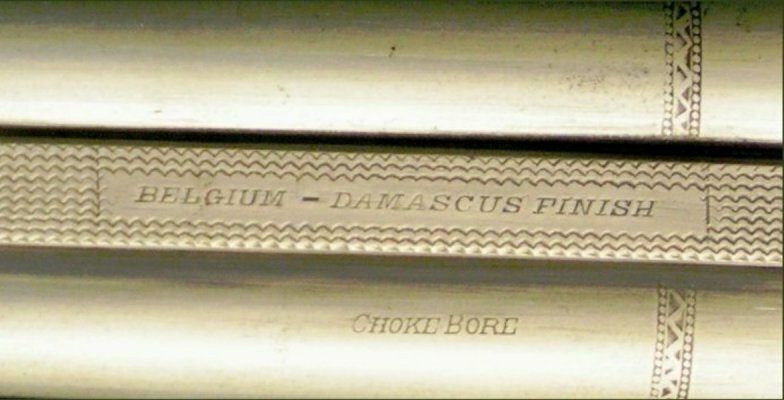 In this case, the pattern is applied by using a heavy roller on the outside surface of the barrel to engrave the pattern. In the above two examples, the forger copied the pattern off a real damascus barrel and transferred it to the barrels using a painting technique called decalcomania, which was invented originally to copy designs onto pottery. The process of decalcomania is still with us today, we only call it by its shorter name, "decal." 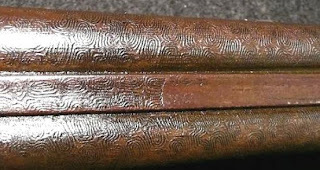 In all these pictures, the reader might be struck by how badly worn out these imitations are, compared to the genuine damascus steel barrels of the previous few threads. This is because of the inferior quality and workmanship of the materials. Unfortunately when these were brand new, some of these were hard to tell apart from the real thing.